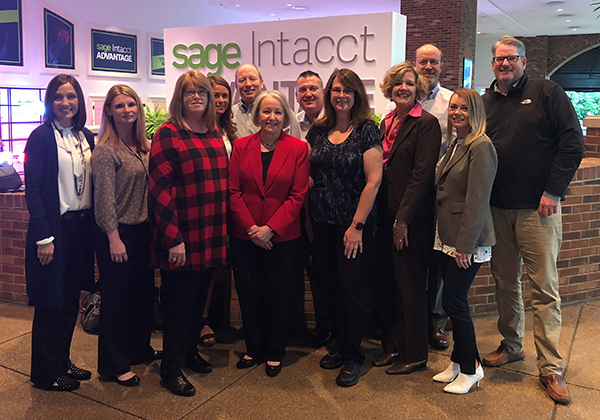 Barbara Harris and the team from Pathway Lending celebrate with LBMC Technology Solutions after receiving the 2018 Sage Intact Customer Success Award. NASHVILLE – Sage, the market leader in cloud business management solutions, announced the winners of the 2018 Sage Intacct Customer Success Awards during a keynote session at Sage Intacct Advantage 2018, taking place in Nashville on October 25, 2018. Since 2012, Sage Intacct has honored customers with Sage Intacct Customer Success Awards for the innovative ways their customers are transforming their businesses. The Sage Intacct Customer Success Awards are designed to recognize and celebrate the customers that have made dramatic improvements to their business and financial operations using Sage Intacct. Each year, Sage looks at hundreds of award submissions. After conducting a thorough evaluation of each submission’s business use-case, the winners are selected. After being nominated by their implementation partner, LBMC Technology Solutions, Pathway Lending won a Customer Success Award and was recognized among the 2018 winners at the 2018 Sage Intacct annual conference. Pathway Lending’s extensive use of dashboards to provide real-time financial and statistical information to all its employees played a key role in winning this award. Other winners of the 2018 Sage Intacct Customer Success Awards include: University Clinical Health; Brentwood Baptist; Nashville Predators, Qualderm Partners, LLC, and Capital Confirmation.